Master the first five levels, Tri-Ducking your way to victory. Disney kicked off October 1 the right way by releasing the 10 Days of Frankenducky level pack for its hit iOS and Android game, Where's My Water? Free. Inspired by the upcoming stop-motion film, Tim Burton's Frankenweenie (debuting in theaters October 17), these new stages feature black and white visuals, Halloween imagery and spooky music. From what we can tell, Disney will let players unlock new stages beginning today and running through October 10 for a total of 30 rubber ducks. That said, here are the best ways to tackle levels 2-1 through 2-5. In this board, the first move is by far the most important. You begin digging from the top left corner of the screen, and must scoop away enough dirt in such a way as to not only fill up the first rubber ducky, but also get as much as possible away from the skeleton's right (your left) arm. Why? Because when enough water travels through the funnel on the lower left, the skeleton raises that arm, trapping whatever H2O remains. 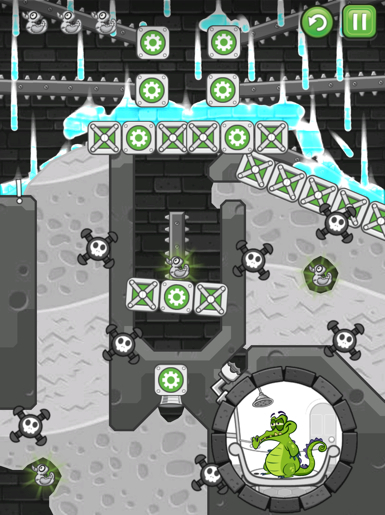 When the skeleton raises its arm, also make note that it lifts the right foot, allowing whatever water has pooled on the bottom to enter the pipe and come out the top right corner of the screen. 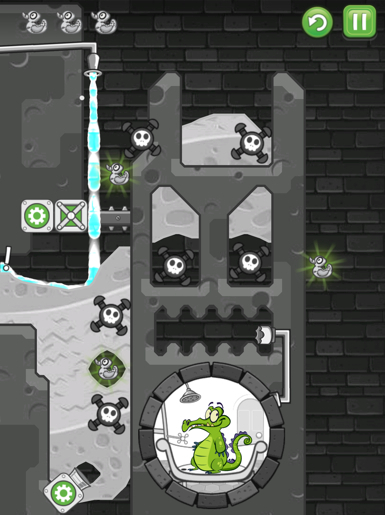 From there, you want to dig to fill up the second rubber duck while at the same time creating two pathways, one to fill up the third and final rubber duck near the skeleton's left foot, and the other to fill Swampy's bathtub. 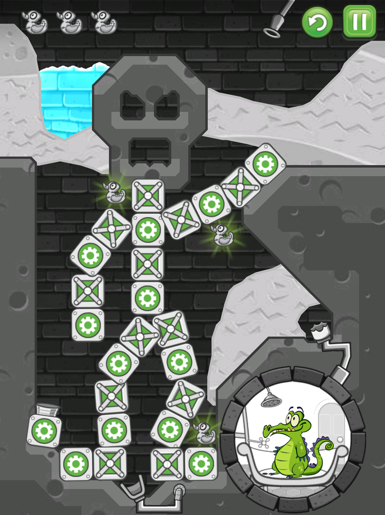 See those seven skeleton icons spread throughout the puzzle? They are your worst nightmare. Turns out, they're bombs, and just a tiny drop of water is enough to set off a chain reaction that essentially cripples the stage, preventing you from completing it. Don't worry. This one's easy. 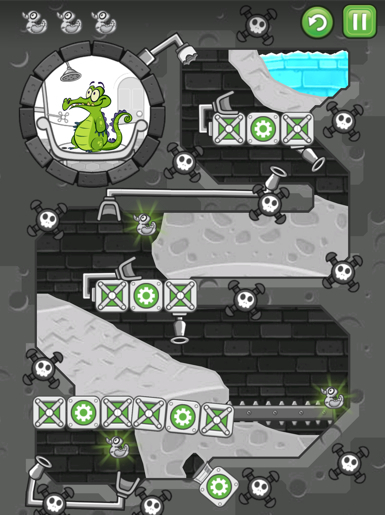 Begin by carefully digging a narrow path towards the first rubber ducky on the bottom left corner of the screen, making sure there's still separation (just a tiny bit of dirt) between the water and the bombs. From there, dig a path in the direction of the funnel to the right. The trick involves digging as close to the stone as possible, thereby creating just the right amount of momentum for the water to travel inside the funnel; you only need a tiny drop. When that happens, you'll see a platform move upwards, thereby creating a pool of water that lets you obtain the second ducky. Now comes the easy part. 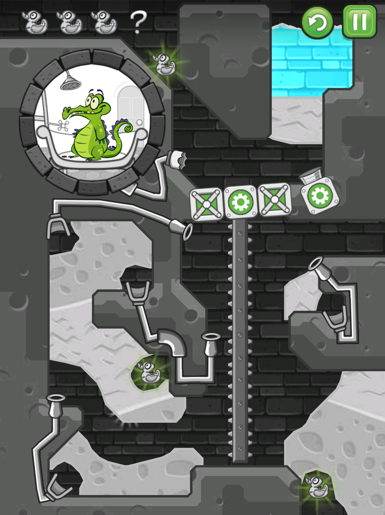 With water pooling near the top, dig towards the right for the final ducky (again, avoid the bombs), and then dig to the lower left to fill Swampy's bathtub. OK, so you'll immediately notice the water falling from the pipe on the top left. See the ducky near it? That's not the first one you want to collect. Rather, it's the one directly beneath it, so dig a path for the water to travel, then dig another to fill the funnel on the bottom left. This will automatically cause a platform on the left to move right, thereby allowing the water to pool and collect ducky number two. This will eventually set off the bomb nearby, but this is OK, since bombs that explode near stone won't automatically set off a chain reaction. From there, dig a path immediately to the right with the goal of setting off that bomb. Allow some water to spill over the side and fill up the third and final ducky. Now, dig to either bomb below to blow them up, and the water will naturally enter Swampy's bathtub. At first, this puzzle appeared to be the toughest of all because there are so many pipes and a limited amount of water, but it's actually quite simple, so long as you make deliberate, calculated moves. Let's begin. First, before setting the water in motion, scoop away the dirt blocking the pipe all the way on the middle right, as this pipe is the only way to ferry water into Swampy's tub. Now scoop away all the dirt holding the water in place. Doing this immediately causes a platform to hit the bottom of the screen, where the water collects. From there, dig a tiny path towards the first ducky on the bottom right. We suggest making it as narrow as possible because you can't afford to lose a ton of water. After collecting the ducky, now scoop away all the dirt on the lower left, then immediately dig an arc that'll guide the water shooting from that nozzle to collect the second ducky. This next move is critical. Instead of digging towards the pipe directly above this one, dig yet another arc towards the one on the right, since this will nab the third and final ducky. Once that ducky is in the bag, immediately cut off the flow of water to that pipe by digging upwards. Then sit back and watch the rest of the H2O head into Swampy's bathroom. Bombs galore, right? Turns out, this is one of the game's easiest puzzles. Scoop away all the dirt so it travels into the first funnel and moves one level down. Now dig a narrow pathway along the top of the stone without touching the bomb to collect the first ducky. The water will gather on the lower right, netting the second ducky. Scoop away the dirt to let the water travel left. Doing this moves the platform out of the way. The water travels into the funnel directly beneath it and comes out of the pipe and fills the final ducky. Now you just need to dig in the direction of the funnel that'll send the rest of the water into the bathtub.